Blogging can have a powerful impact on your business’ online brand exposure! Starting a blog is easy, but many find that blogging consistently and optimizing their blog for a good user experience can be difficult. Whether you are new to blogging, post frequently or looking for new ways to boost your online exposure, these 4 recommendations will help better your blog’s impact and take your wedding business to the next level. For more blogging tips, check out the recent webinar, Blog Your Way to a Better Business in the Education Center within your account. Do you ever wonder what impact that blogging can make for your business? This month’s educational webinar for premium members focused on the power of blogging for your business’ online exposure. WeddingWire CMO Sonny Ganguly welcomed new Education Expert Andy Ebon as the host of this session. Andy shared his insights on why blogging matters, how to stand out online, and tips for taking your content efforts to the next level. Interested in starting a blog and wondering what platforms to review? Check out WordPress, blogger, tumblr and typepad and see which suits your business needs and personality best. Want to take your blog to the next level? Once you start a business blog, be sure to use plug-in and add-ons to make your blog more dynamic and user-friendly. Common helpful updates include SEO optimization, search functionality and blog mobilization. Want to drive traffic from your blog back to your Storefront? Add your free, customizable WeddingWire widgets to show off your WeddingWire reviews, schedule appointments, add a contact form to your blog and more. Whether you are an avid blog reader, have some blogs and online content you follow regularly, or even if you haven’t yet developed a following on industry blogs – an RSS feed can help improve your business by giving you a great daily dose of Education! First things first – what is an RSS feed? An RSS is technically called a “Rich Site Summary” and serves as a web feed or “personal channel” where you can search, follow and track frequently updated web content – commonly used for blogs and news headlines. Why consider using an RSS feed? RSS feeds allow you to easily and quickly stay informed on the latest content of your favorite news, blogs and web content resources that interest you and apply to your business. This way, instead of starting your day and checking your favorite five sites, you can add them to your feed and the latest posts will all appear in one easy to review and preview feed – saving you time! Stories or posts that interest you can be clicked, and you will be directed right to the full post. Setting up a feed reader is easy! There are a variety of platforms available. You may have heard Google recently announced a change to their popular feed – Google Reader. It will no longer be available as of July 1, 2013, but luckily if you do have a feed with Google Reader you can export your feeds to a new reader using Google Takeout. There are a variety of popular feeds available to explore, including: netvibes, Pageflakes, and Bloglines. Additionally, you may have one associated with your email account, such as Yahoo!. Once you have established a feed, start to visit your favorite sites (including WeddingWireEDU, of course!) and add their RSS to your feed! If you have questions, we suggest looking at the feed’s help section for tips on getting started. Once you have established your feed, you can continue to add to it as you find new favorite blogs, sources with great articles, and any news sources that you would like updates from. Some sites we would recommend include: American Express’ Open Forum for small business tips, Mashable and TechCrunch for the latest in tech, WeddingWire’s blog for wedding inspiration and WeddingWireEDU for tips, updates and advice for Wedding and Event Pros! As new content is published, it will be delivered to your feed in chronological order. That way, whether you constantly refresh your feed or catch up on a weekly basis, you can scroll through the content and review the posts that appeal to you and your business. Once you have your RSS established or further developed, find a way to incorporate it into your daily (or even weekly) routine. Catch up on the latest posts as you enjoy your morning coffee, dedicate some time to learning over lunch at your desk, or review the day’s relevant posts as you unwind watching a favorite evening TV show. Whatever works for you! RSS feeds are a great way to ensure that the latest industry happenings, tips and advice is delivered right to you! » Get Published on WeddingAces! Interested in being a wedding blogger? If you’ve always wanted to start your own blog, but haven’t been able to make the leap, here’s an opportunity to test the waters! Or, if you are a seasoned blogger, looking to expand your reach, consider becoming a contributor for a WeddingWire blog! We’re looking for guest contributors to share their wedding wisdom with our readers on our WeddingAces blog! WeddingAces’ content is exclusively provided by Pros like you, and is designed to provide engaged couples with firsthand knowledge and experiences of planning a wedding from the experts themselves. We are searching for more voices to add to the mix! Our Aces share tips, tools, and tricks of the trade for all aspects of planning a wedding. It’s easy! Please note that all topics and posts must be exclusive to WeddingWire (meaning it can’t be something you’ve already written for your own blog or site), and all content is subject to editorial approval. We’ll make sure that you, and any other Pros or photographers you mention are appropriately credited. And again, please just write a brief topic description of your planned post – do not submit an entire post to us at this stage. Any questions? Send us a message and we’ll respond ASAP! Good luck; we can’t wait to hear from you! So, you’ve started your very own blog. Maybe you’ve been consistently creating content for a month or two, but now you find yourself stuck with nothing more to write about. You have writer’s block, a totally common ailment that all writers face every now and again. Rather than let your blog sit dormant (not the best idea if you’re looking to grow followers and social shares), let us help you get your creative juices flowing with our tips for beating writer’s block! We’ve done the brainstorming for you and created some fun topic ideas for your business based on your wedding industry category. Now you simply have to set aside some time, get ready, set, and start blogging! And, remember, beautiful, unique and interesting images showcasing your work is always important to include on your blog (such as the photo below)! “A Venue For All Seasons” – Share (professional) photos of your venue in different seasons, highlighting how the space could be utilized and decorated at different times of year and for different style events. This shows the beauty and versatility of your space! “Real Couple’s Menu” – Outline a creative menu from a recent wedding, and discuss how you worked with the couple to make their vision come to life. Share professional photos of the food, if you can! “Flower of the Week” – Write a post featuring a specific blossom. Talk about why you love the flower so much and share some photos of bouquets or centerpieces you’ve created using the particular bloom. “If I Could Plan It” – Design a dream “wedding” for a recently-engaged celebrity. Which flowers would you suggest Jennifer Aniston use at her wedding? Which venue would you choose for Kelly Clarkson? This is a fun way to let your imagination run wild and show couples how creative you can be! “What’s That Song?” – Share a few under-the-radar songs that would work well at various moments throughout the wedding, or your favorite “crowd pleaser” songs that always get the party started or create a special unforgettable moment. “Perfect Pairs” – Showcase a wedding gown that you carry in your salon, along with a bridesmaid dress that would look great alongside it. Give insight into the designer, the style and fit. This makes a great weekly feature! “Real Weddings and Events” – You’re in luck. You can easily share real weddings and events on your blog. But instead of just featuring photos or video of the event, be sure to get some quotes from the couple and feature a full vendor list to give credit where it’s due. Use great descriptive words to explain the event, and people searching for similar inspiration will more likely find your work! Request that your featured couple, and the other Pros involved with the event, share your post on their social networks to gain added exposure. Thinking about creating your own website or blog for your business? Take a look at these simple tips that can help you make sure your readers are able to find the most critical information on your site as quickly and easy as possible. 1. Keep it simple. Internet readers in the digital age tend to look for keywords, skip around the page, and have lower attention spans than in the past. Be straightforward with your content, don’t include excess information, and avoid long paragraphs and sentences. 2. Use More Headings to Separate Content. Studies have shown internet readers also read in blocks, and will try to focus in on exactly what the reader is looking for. They will often skip over words and search the pages in an “F-shaped pattern”. Start by outlining what you would like to cover on your page to determine when it is necessary to insert short, concise headlines. 3. Make Your Site Easy to Scan. Design the layout of your site by taking into account your readers will often skim your site. 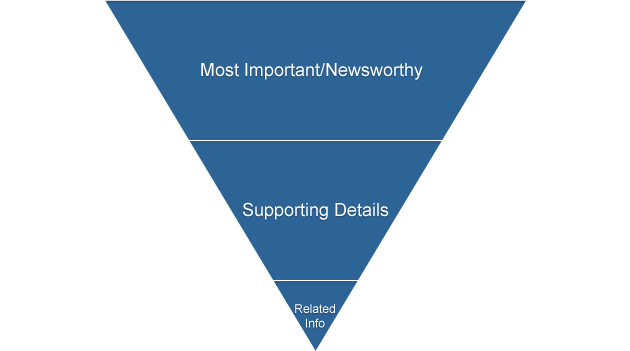 The inverted pyramid writing style demonstrates where to place your most important information in your content so the reader sees it first. 4. Take Advantage of Bullets and Text Formatting. Using bullets and text formatting, such as bold or italicized text, can attract readers attention and help highlight the most important information. Get found by more brides. It is important first that you get potential customers to your site. To do so, invest in some advertising – even if it is just Google AdWords for your service category and location. This will boost your visibility and ranking for search engines. Also make sure you frequently update your content, whether its on your website or blog, it is important to stay up to date even if it is just adding images from recent weddings. Engage with the engaged. Give visitors a reason to get involved whether its with social media or a contest. User engagement is an important way for customers to feel involved and also spread the word about your business. Also make sure when you receive a comment or inquiry you respond quickly (within an hour is best!) Brides will be impressed with your responsiveness and are more likely to commit to your business if you catch them when they are thinking about it. Analyze this. Keep an eye on your website, blog, and social media analytics to know who your customer is and cater to them in the future. If you know the most popular time of day for brides to look at your website, you will know that is a good time add fresh content. For additional ideas, read the full article from American Express OPENForum.